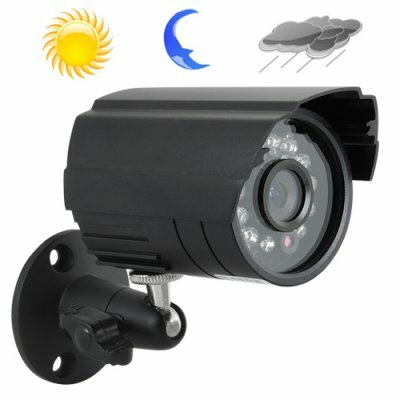 Successfully Added Mini Security Camera (1/3 SONY CCD, Night Vision, Waterproof) to your Shopping Cart. Mini sized Waterproof Night Vision Security Camera with 1/3 SONY CCD. Protect your home or business with this durable, high-quality outdoor security camera with advanced Sony CCD video imaging sensor. Anyone concerned about security will appreciate this durable, high-quality video surveillance camera. With clear resolution and a long viewing range, this powerful camera is perfect for keeping an eye on the outside of your home or business all day and night, rain or shine. The 1/3 inch Sony CCD lens gives a high quality image and wide viewing angle, while the infrared (IR) LED's provide excellent night vision, even in complete darkness. This new mini size gives you all the performance you would expect from a full sized CCTV security videocamera from Samsung, Panasonic, Vitek, IQ or Messoa, but gives it to you in a half sized mini housing - thereby allowing you to more easily mount this surveillance camera wherever is most convenient for you. The heavy-duty cast aluminum casing protects this camera from water and stormy weather while the included mounting bracket allows easy installation and aim positioning exactly how you want it. Mounting holes on both the top and bottom of the camera let you install it on top of or under any flat surface. For maximum home and business security, nothing beats the mini sized I35 Waterproof Night Vision Security Camera with 1/3 SONY CCD for improved safety and peace of mind. Brought to you at a low wholesale price by the leader in factory-direct electronics, Chinavasion.